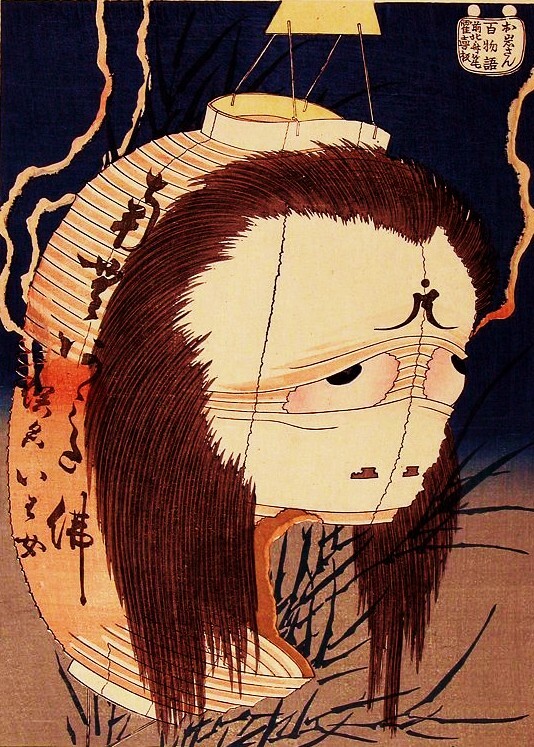 In the Meiwa era (1764-72), near the village of Takekura in Honjyo-Go, a gang of tradesmen were gathered around a strange living creature that they had almost beaten to death. Their supervisor happened on the scene and stopped them, then sent for Ooda Chogen to see if the thing could be identified. Chogen quickly arrived and said “This is what we call a suiko (water tiger). 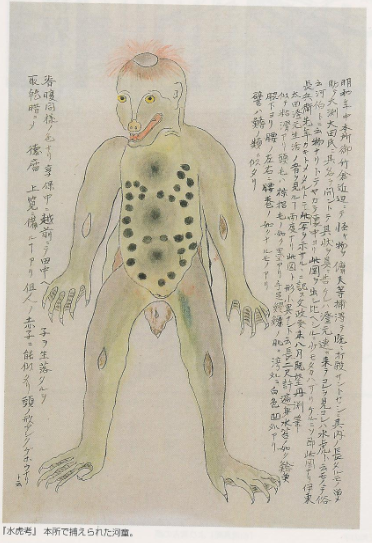 Over in the valley they call it a kappa.” Chogen then reached into his breast pocket and produced a drawing so he could compare the similarities and differences. 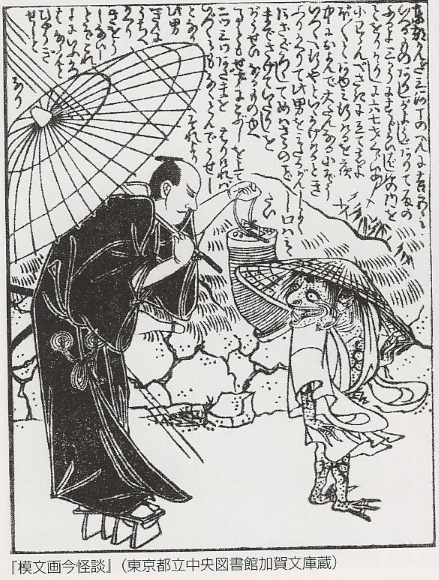 (It is said that a copy of that same picture was made by Ito Chohei in the mid- Bunsei era (1823)). This was the second time that Chogen had encountered this particular strange living creature. He had made the sketch after his first encounter, and the thing before him now showed no discernible differences. 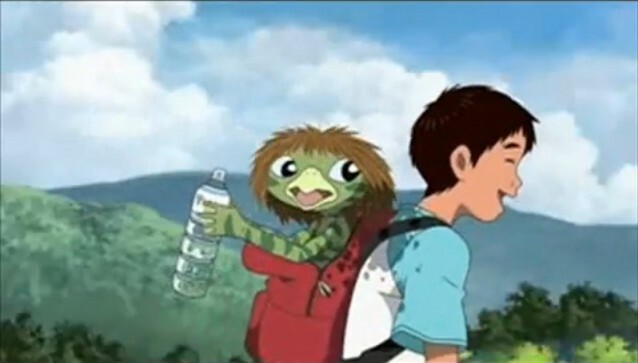 It was about 2 shaku long (60.6 centimeters) from head to foot, and looked like it was covered in moss. The body was as slippery as a catfish, but the hair was as black as palm-tree hair. The arms and legs resembled the skin of an eel, and on the top of the head was a depressed bowl. The back and the belly was the same color. 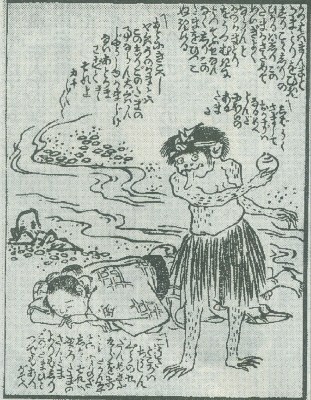 During the Kyoho era (1716-36), excess children were sometimes abandoned in the rice fields in anticipation of the Imperial Inspection of farmer households. This strange living creature was said to resemble those abandoned human children.